My most recent RedBox rental was not using a free promo code I got from my friend on Monday. It was a code that RedBox sent me for filling out a short survey after renting a movie. Yes, I rented a movie for them using a promo code and they sent me a survey about the rental experience in order to give me another promo code for a free rental! I LOVE this company! 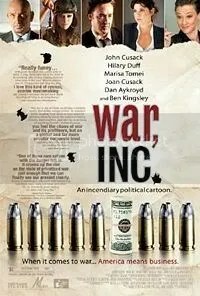 I decided to rent War, Inc. a newly released (on DVD) movie starring John Cusack. You may not have heard of this movie since the Wiki entry claims it released in only 30 theaters nationwide. I will say that after seeing it, it should have been a MUCH bigger release. This is a good movie. Tags: Cusack, entertainment, Joan Cusack, John Cusack, movie, Movie Review, Review, War Inc.